Well, this was actually a lot of fun. Because on the surface, this is a terrible idea. Or maybe just a painfully retro one. Teenage sidekicks have been out of vogue for decades, especially ones that closely echo the theme of the hero they sidekick for. And it might work for the Legion of Superheroes, but the idea of naming a character created in the 21st century Iron Lad is... Well, it's hardly current. 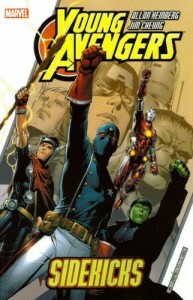 And as a team name, Young Avengers is no better. I have a sneaking suspicion that some of these decisions were made by editorial and handed down to the Heinberg as Things He Must Do, which is kind of a shame. I remember when Young Avengers first hit the stands that I cringed at the name and passed the book by. That was not my wisest decision. The thing is, as hokey as the name and the general concept are, this is not a hokey book. Not even slightly. The characters are engaging, in a very real, not-even-slightly-cheesy way. The dialog may not always be sparkling, but it's real and fits the characters. And the story holds together. It's easy to rely on the teen fiction standard of adults who just don't understand, but here it makes sense. I absolutely believe, without a moment's doubt, that Captain America would not want a teenage kid to dress up like Bucky and fight crime, especially when that kid turns out to be the grandson of the real first super soldier. (Is this what firmly established [b:Truth: Red, White, and Black|670341|Truth Red, White, and Black|Robert Morales|http://d202m5krfqbpi5.cloudfront.net/books/1176970351s/670341.jpg|656375] as part of Marvel's continuity?) If I'd read [b:Avengers Disassembled|105969|Avengers Disassembled|Brian Michael Bendis|http://d202m5krfqbpi5.cloudfront.net/books/1348253902s/105969.jpg|102150], Iron Man's motives might have been even more clear, but what I did know was sufficient for me to buy his position. I did find myself rolling my eyes at the boys' club mentality some of the characters, particularly Patriot, displayed when (gasp!) girls wanted to join the team, but I do think that was intentional. They're never shown as being in any way reasonable in wanting to keep Kate and Cassie out, and I think Heinberg wanted the reader's reaction to their acceptance to be, "It's about time!" I had fun with this book, and I liked the characters. So here I go again, trying to catch up on a title long after I should have started to read it. I like Teen Titans, and it should have occurred to me that I would like Young Avengers, too. Especially because the latter also has a blonde girl named Cassie who wears a red costume, in one of the closest total coincidences I can remember seeing in comics.